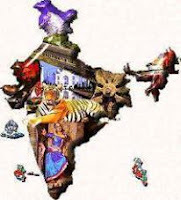 India GK Question Sample Paper 10: India General Knowledge (GK) Sample Question Paper No. 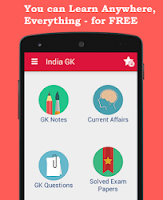 10 with Collection of India GK Questions under GK Quiz in PDF @ India GK Sample Papers. Q.171 As per Jawaharlal Nehru which is "New Temple of Resurgent India" ? Q.172 Who is Inventor of "C" Programming language ? Q.173. Where didi Lala hardayal and Sohan singh Bhakna form the Gadar Party in 1913 ? Q.174 Which among following is not a programming Language ? Q.176. In which year Mahatma Gandhi's famour work HIND SWARAJ written ? Q.178. Lala lajpat rai was assaulted by Police in a demonstration which caused his death. That demonstration was against ? Q.179. In the National Flag, which colour is used in the wheel ? Q.180. Who of the following laid the first rail-road in India ?